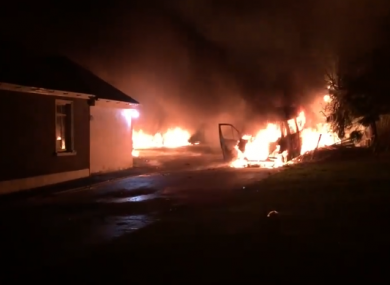 LOCAL TDS HAVE condemned an attack on a property in Roscommon over the weekend, which left eight people injured and caused significant damage. The incident took place at a farmhouse outside of Strokestown in the county early yesterday morning. Local TD Michael Fitzmaurice last week raised the issue of the repossession in the Dáil. “Last Tuesday there was people injured, there was violence; from what we’re hearing there was violence last night,” Michael Fitzmaurice told RTÉ News. That’s not going to solve any problem. The only way you will solve problems is by talking and negotiations with banks. Fianna Fáil TD Eugene Murphy said that “the people of the area do not want this”. “But also they would like to see the family back in their house if possible. I went to school with those people. Two of them are in their mid-50s, one early 60s. I know them well, they would be very well-known in the area and I think the general consensus is we should be able to try and get them back in to their home if at all possible. In a statement carried by RTÉ, Justice Minister Charlie Flanagan said that he had requested that his officials examine the regulation around personnel enforcing court orders by the Private Security Authority. Email “Local TDs condemn attack on repossessed Roscommon farmhouse, but call for negotiations to keep family in home ”. Feedback on “Local TDs condemn attack on repossessed Roscommon farmhouse, but call for negotiations to keep family in home ”.